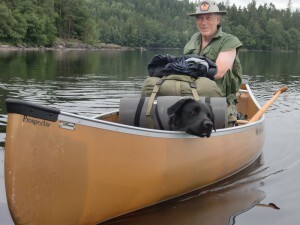 For 5 days I and my old friend Preben and a dog called Charlie. Preben is 74 years young but still paddle daily and know these waters very well and worked as my personal guide during this week. 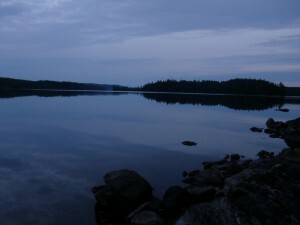 The plan was to plan through the lakes Ömmen and the Nären lakes, we had plenty of time to explore the lakes. Ömmern and the area around are classed as a national interest for nature conservation. It is a fairly large lake and has over 30 islands with some being bird protected. There are no campsites with lean to, toilet and a nice pile of fire wood waiting for you here, but there are places that are used for campsites with prepared fireplaces. During our trip most of them were clean and we did not have any problems finding firewood. It was on this lake we started our journey, on the southside on the portage trail coming up from Torskabotten lake. We started out on midday and had our sight on an island we had both had been there many times before, it is a really good place to make camp and have a nice sandy beach. It was not a long paddle to go there but when we got there we saw that other people already were there, these were the only other canoeists we saw during the whole week. We made a quick decision to go to another island called Aborreö that was not far away. The wind was not on our side today and we had a strong headwind paddling further up north to this island. I used my extra paddle which is not my favorite paddle and a quite cheap one but good on lakes and it gave me something I never got when paddling before, blisters on my hands. The island was a perfect spot and it also had a nice sandy beach and big enough to go exploring in the evening together with Charlie. The next day we started early and we were really lucky by having no wind and a nice sunny day to paddle on. When paddling we saw lots of birds especially when going past the bird protected areas, but most of them I can’t even identify. To be able to get into the Nären lakes we would have to pass through the small lake of Hjulsjön to get to the portage that would take us up to Nären. But to get to Hjulsjön we had to go through a very small and rocky stream. This is sometimes possible to paddle through depending on the water level, otherwise it´s easy line through this part. Once in Hjulsjön it´s time to find the portage, we found a brilliant place with good landing spot and a nice trail going in the right direction but also a sign saying “Portage 100 m to the right”. 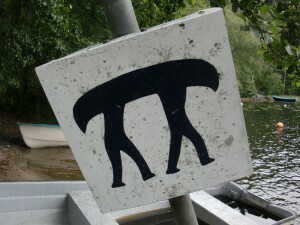 The real portage can be a little hard to find so keep an eye at shoreline to find it. The portage is a nice easygoing trail for about 350 m. We carried our canoes on the portage but it´s probably possible to go over it with a canoe wagon as well. Once up in Nären we had again no wind and the sun was still out and we had a brilliant time discovering part of the lake while looking for a good campsite. Just between Store-Nären and Lille-Nären (big and small Nären) we found the perfect spot called Silverbergen (Silver Mountains). It had all we wanted, a nice sandy beach and a good camp spot higher up in the hill. During the evening and most of the night it rained heavily, so after making our daily bannock we went to bed laying under our tarps and listening to the rain. The following day the sun was back again so we took the chance to clean our equipment, maintain our tools, dry up any wet gear and of course maintain ourselves by having a bath in the lake. This was a really slow day spent mostly laying in the sun reading, walking around exploring, fishing and planning what to do the following days. I wanted to paddle through Ören and then go down through a small stream called Laxån which leads back to Ömmern. Preben said it was too rocky to paddle, but he paddled it over 20 years ago so I hoped it would have changed. So this morning we separated and decided to meet up at our old camp place on the island we both been to before. We decided to meet up there and if someone of us would not be able to make it we would call each other during the evening just to let each other know we were ok. Preben spent most of his time exploring the Nären closer and found a good campsite for next time we come here. For me it was just a short paddle before I had to portage into ören. The portage was really easy with a small road to walk on. Once in Ören I was again lucky by having no wind and could go out and crack the mirror once again. After a short while I saw something you don’t see often, an Indian settlement with several teepees. Apparently this is a guy calling himself the Bearhunter running a cowboy and Indian camp for different events. The paddle though Ören is probably one of the best times in a canoe I have ever had, the still water high mountain sides and the small cabins and the Indian settlement made this a really good paddle. Unfortunately there are not many places to set camp around this lake. 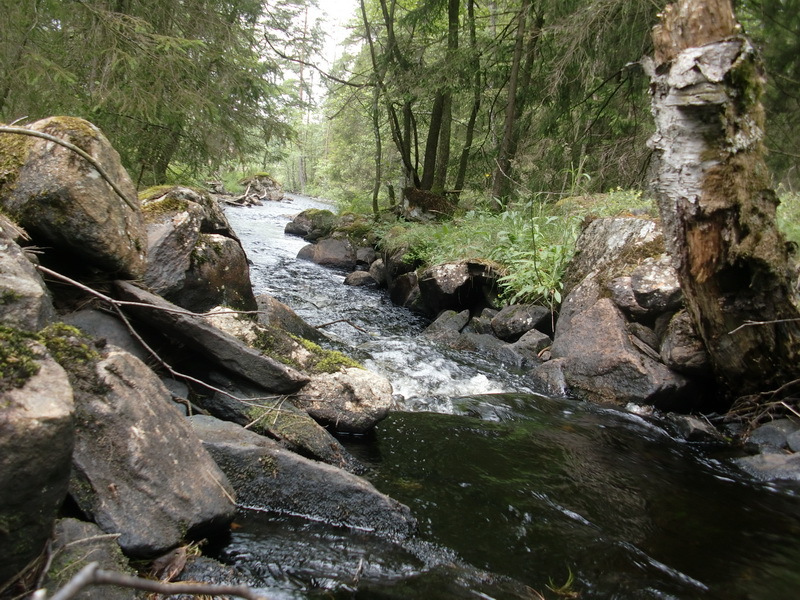 At the end of Ören the stream Alxån began and the start of a hard and with very little paddling stretch started. The stream is not very big and a very rocky in some places meaning I had to line though most of it. I spent a lot of time lining through the small stream, but still managed to paddle through some really beautiful areas and also got to experience how it is to paddle down a small waterfall, scary but fun afterwards. I would not recommend going down this stream. After a few hours of hard work I got through the stream and ended up in the south end of Ömmern. This I celebrated with some bannock, dried meat and big cup of coffee. I was really tired and the quick lunch restored my energy so I could continue paddling up north to meet up with Preben again that had already set up camp on the island. The evening was spent telling each other stories about what had happened through the day. The last day became a short one, with dark clouds over our heads we decided to go back early to avoid the rain. We were again lucky and had nice paddle back and once back at Prebens we had lunch and listened to the rain pouring down. This paddle is quite short a 5-day paddle, but since we wanted to take it easy and go exploring and enjoy the week it was perfect. There are many possibilities to prolong a trip in this region. 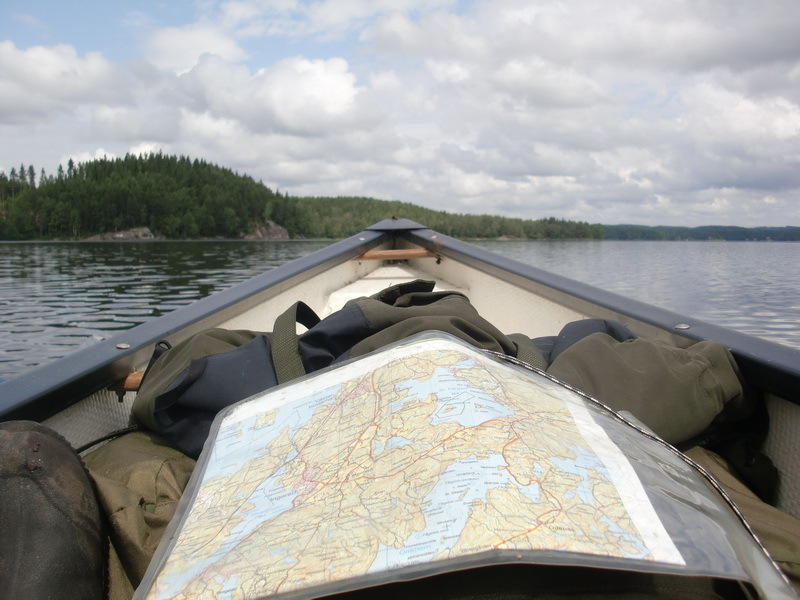 If you are renting canoes you will have to get through the lake of Torskabotten and Lill-Bottnasjön and portage up to Ömmern making the trip longer. The area has real feel of wilderness to it, there are houses around the lakes but big stretches are woodland. We saw very few people on our trip and heard very few other sounds then those of the wilderness. There are many places to set camp but there are no really set campsites but then again they don’t cost anything to use. If you want to go here it is quite easy even if you are flying in, the canoe rental can even pick you up at the Landvetter Airport (according to their website). The closest village to the start of the trip is Tollered (30km outside Gothenburg, 26 km to Landvetter Airport). Tollered has small shop, Pizzeria, restaurant and a hotel. Detta inlägg postades i English, Nature, Ute och omkring och märktes canoe, Canoeing, Kanot, Vildmark, Wilderness den juli 9, 2011 av Johan, Nordic Bushcraft.